Students and senators future, past, and present reacted strongly to the news that 11 of the 16 current student senators have missed at least half of the UVic Senate meetings, as reported by a Martlet article published on April 5. 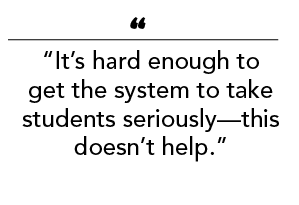 “I get not being able to make it to meetings, being a student is rough and classes make everything difficult pretty frequently,” commented Taisto Witt, who ran unsuccessfully for the Senate, Board of Governors, and UVSS Board of Directors in 2017, about the Martlet’s coverage of student senator absences on Facebook. Since the publication of the article, the Martlet confirmed that at least two senators are in violation of Section 7 of the UVic Senate’s official Rules and Procedures. Elected senate members are entitled to a leave of absence for “no more than three consecutive regular meetings of Senate,” according to the policy. Without explicit permission granted by the Senate’s chairperson, the policy dictates that any further absence will lead to a request for the senate member’s resignation. However, none of the student senators in violation of this policy have announced any intention of their resignation from the Senate. 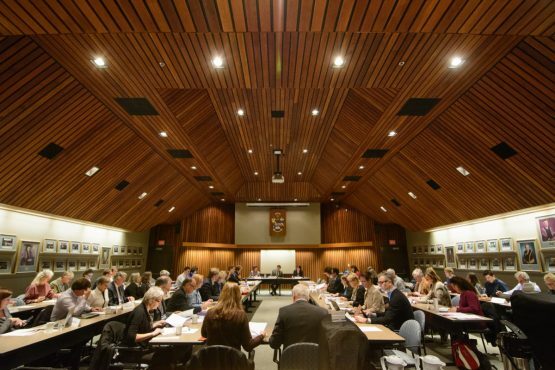 As the Martlet previously reported, Associate University Secretary Carrie Andersen confirmed that no one in the past five years has been asked to resign in accordance with Section 7. Another topic of discussion for many members of the UVic community was whether students should be allowed to run for both a position on the Senate or Board of Governors and also the UVSS Board of Directors. Pierre-Paul Angelblazer, student senator and UVSS Interim Director of Outreach and University Relations, replied to this discussion on Facebook that this was something “already written out and being considered,” as he had brought it to the attention of the UVSS policy development committee to be recommended to the Electoral Committee two weeks prior. “It didn’t make sense to exclude the student who are already the most involved in governance from being a part of governance, especially if their role isn’t to represent their organizations (UVic and UVSS), but the student voice as a whole,” said Angelblazer on why the policy had been voted down. He anticipates it coming up again next board term at the electoral committee. Noor Chasib, Mackenzie Cumberland, Dheeraj Alamchandani, and Angelblazer currently hold positions on both the Senate and UVSS Board, and have all been absent for four or more meetings without sending regrets. Alamchandani is currently on leave with permission from the Senate chairperson. This past week, both Angelblazer and Chasib stated that they have never requested leave from the Senate, which confirms that they are in violation of Section 7 of the UVic Senate’s official Rules and Procedures. Angelblazer and Chasib have been respectively absent for six and seven of the seven Senate meetings since being elected. Cumberland, who is listed as absent without regrets in the minutes of five consecutive meetings, may also be in violation of this policy but refused to disclose if she had requested leave from the Senate. Cumberland and Chasib declined to comment on their absences, but Angelblazer said that the obligations of his unforseen role as the interim Director of Outreach and University Relations made it difficult to attend Senate meetings, particularly in the fall. As for the March 2 Senate meeting, the day preliminary UVSS election results were released, Angelblazer explained that his decision to skip was brought on by further conflicts between his roles in the UVSS and Senate. The Senate meeting ran from 3:30 to 5:00 p.m. that day, but the election results were not officially released until 8 p.m. There is one more Senate meeting, scheduled for May 4 at 3:30 p.m., before the student senators elected this spring take office. Newly elected student senators and UVSS Lead Directors Curtis Whittla and Isabella Lee are already planning out their schedules to ensure they can attend as many Senate meeting as possible, especially in light of the scheduling complications experienced by students with similar obligations this year. As for this year’s student senators, it is unlikely there will be any changes in membership before this Senate term ends. This story has been updated to fix a misspelling of incoming student Senator Curtis Whittla’s name. We sincerely regret the error.